The Longford area is admired for its idyllic country landscape. Longford, we had been told, has some of the prettiest pastoral scenes around. We saw evidence of this even as we were driving into the town. 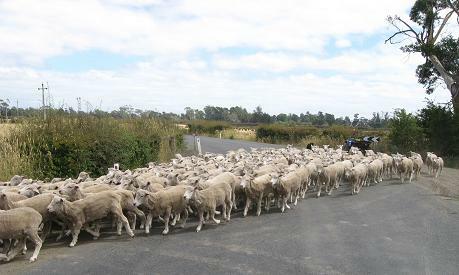 We passed people relaxing by riverbanks, huge silos of grain, bales of hay out in the fields, plus a special treat - a sheep crossing! The farmer was very polite and apologised for his sheep holding us up. Not at all I thought, and asked if it was all right for me to take some photos. 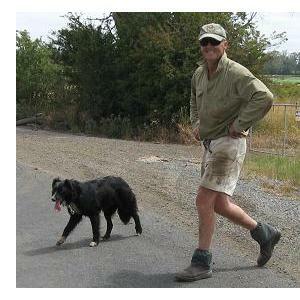 Friendly Molly (the gorgeous sheep dog) raced over to say hello, enthusiastically placing her front paws on my legs. She was called off immediately but there was no harm done. Far from it, I was simply delighted! 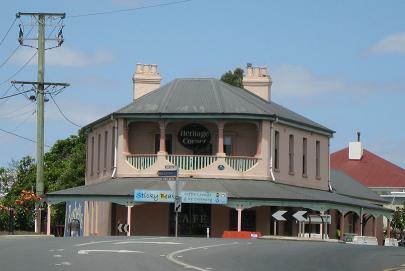 Longford is well known for two of Australia's most historically significant country estates, Brickendon and Woolmers. 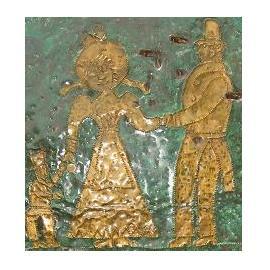 Both properties were developed by the free settling Archer family. Incredibly, Brickendon is still farmed by the Archers, now in their seventh generation. The first white settlers here came from Norfolk Island in the early 1800s. These pioneers were provided with free convict labour. As a result, there are many convict built houses in the town. I was very struck by the beautiful historic buildings. The original architecture is largely intact. Want to discover the history of the area in an interesting and fun way? Perhaps solve some crimes committed in the 1830s? Try the Skulduggery game. After coming across the sign and the sculpture next to it, we were intrigued. At the Visitor Centre, we found out that we had seen one of the "clues" related to the Skulduggery game. It is actually a series of three games. Each game is related to a single crime. The games allows you to test your detective skills. At the same time you can get better acquainted with the history of the region. The game sounds fascinating - I must go back and try it out! The Visitor Centre is located in a building that was once a flour mill. The mill was operating as early as 1834! It seems very appropriate that there is now a bakery in this building too. 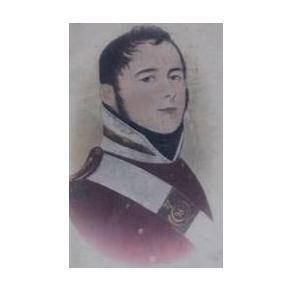 We came across this photo of Lieutenant Thomas Laycock Jr. He is believed to be the first European to have traveled through this area back in 1807. He was in search of famine relief and was unfortunately unsuccessful. For his efforts though, he was rewarded with one cow! Might seem funny now but I imagine it would have meant a lot in those days during a time of famine. I find that I'm getting more and more interested in historic buildings. I do believe Tasmania has something to do with it. I loved the look of this building, situated at a major junction in Longford. The "Corner Shop" has been an inn, a chemist's dispensary, even a watchmaker's. At one time it had a skittle alley (like a ten-pin bowling alley) in the rear. The building dates back to the 1830s. Across from the Corner Shop, I spotted Brown's Big Store. It was built by someone named - you guessed it - Brown, first name Alfred, back in 1889. It continues to serve the region even today. 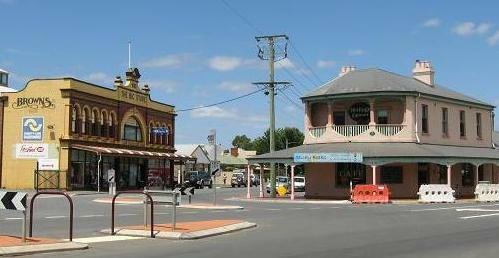 I would have loved to explore more of Longford's historic village precinct but that will have to wait for another day.